Archbishop Thomas Wenski presents Raoul G. Cantero, III, former Florida Supreme Court Justice and a Coral Gables resident, with the Thomas A. Horkan, Jr. Distinguished Catholic Leader Award. TALLAHASSEE | Raoul G. Cantero, III, former Florida Supreme Court Justice, was honored March 27 with the Thomas A. Horkan, Jr. Distinguished Catholic Leader Award. 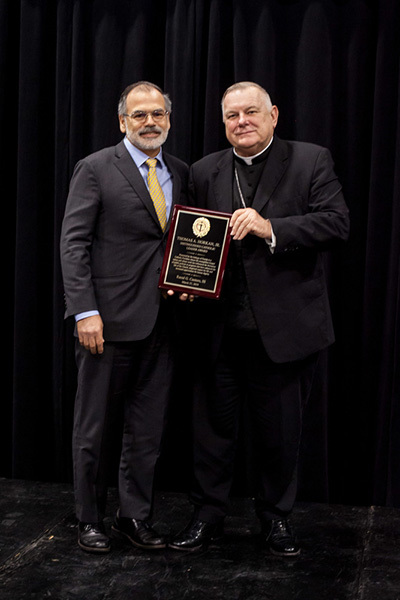 Michael Sheedy, executive director of the Florida Conference of Catholic Bishops, presented the award by drawing several parallels between Cantero and the award’s namesake. “Both are notable for their faith and love for the Lord, mediated through the Church, and a love of their wives and children and the people around them,” said Sheedy. Both also hail from Miami; both trained as attorneys, left successful legal practices and moved to Tallahassee for service. Cantero is consistently recognized in legal directories among the top or best lawyers in his area of practice in Florida and indeed the nation. He was appointed to the Florida Supreme Court in 2002, the first Justice of Hispanic descent to sit on the Court. He served in that capacity until 2008. He is currently a partner at White & Case and leads their Miami Disputes Practice. Cantero is a 1978 graduate of St. Theresa School in Coral Gables who went on to high school at Christopher Columbus High School in Miami. He is a member of St. Augustine Church and Catholic Student Center in Coral Gables. 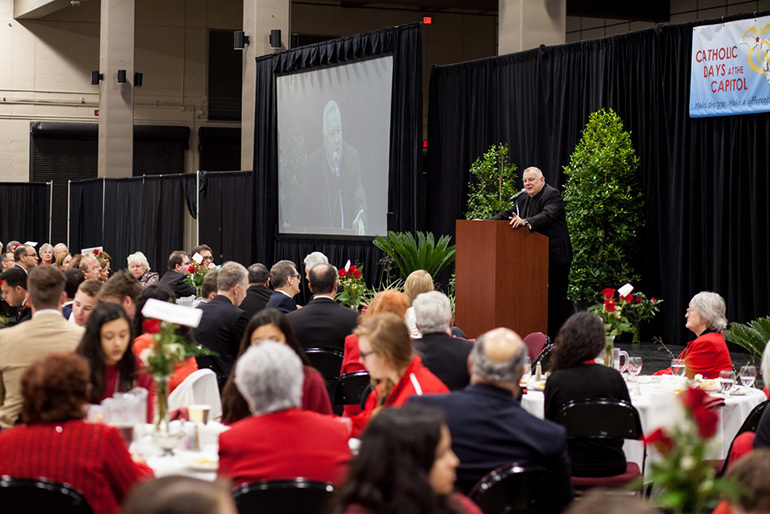 Archbishop Thomas Wenski speaks to participants from throughout Florida who attended the Catholic Days at the Capitol luncheon with Florida's bishops.